A wide variety of services to support student health and well-being are available at the Health Center. To learn more about our medical staff, please see our list of Providers. There are two fulltime Sports Medicine physicians available at UCF Student Health Services to all UCF students and athletes. Our focus is to prevent and treat sports or exercise-related injuries. Services include: in-office evaluation of acute and chronic musculoskeletal injuries (including back pain), on-site radiology services, non-operative treatment, expedited orthopedic referrals if needed, concussion management, management of athletes with acute illness, medical management of athletes with chronic illnesses, joint and other MS injections as appropriate, and injury prevention evaluation. 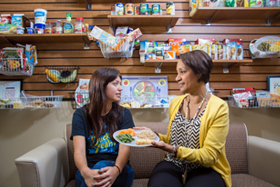 Clinical Dietitian services are available to students who have obtained a referral from their healthcare provider. If a student obtains this referral, they may schedule a one-on-one consultation with the Clinical Dietitian, who can help them with: weight management, eating disorders and body dysmorphia, hypertension and pre-hypertension, anemia, diabetes, and digestive disorders. Board Certified Psychiatrists and Psychiatric Nurse Practitioners are available at the UCF Health Center to provide care to students. Students are provided with a psychiatric evaluation, diagnosis, and treatment of the full spectrum of mental health conditions. A referral is required prior to scheduling with a psychiatrist. This referral may be obtained from a previous medical or mental health provider, from one of our primary care providers, or from the UCF Counseling Center. Please have your previous psychiatric records sent to the UCF Health Center prior to your initial appointment. Some conditions, including ADD/ADHD, require that comprehensive psychoeducational/neuropsychological testing be completed within the previous 3 years prior to the initiation of stimulant medication per UCF Student Health Services policy. UCF Health Center staff can assist students with scheduling an appointment with community providers to obtain this testing, if necessary. * Mental health counseling services are available to students at Counseling and Psychological Services (CAPS). Are you concerned about your substance use or that of a friend? Schedule an appointment with one of our treatment providers. Students are offered a biopsychosocial evaluation, diagnosis and intervention on the spectrum of prevention, treatment, and recovery from substance abuse, and compulsive behavior. We do not require a referral for services from a medical provider. However, students may be referred by UCF Student Health Services, the UCF Counseling Center, and outside community resources. On-campus support groups–Alcoholics Anonymous, Narcotics Anonymous, Al-Anon, and other relapse-prevention groups meet weekly. For a list of the meetings visit the CRC page. Call 407-823-2924 to make an appointment. This service is available for students who have already begun taking allergy immunotherapy. Students must have received their first round of shots by their allergist before they can start receiving injections at our clinic. Forms must be filled out and submitted by the patient and their allergist. Note: The clinic does not perform the initial allergy testing, nor does it administer the first round of injections. There are fees associated with the injection service, which may be insurance eligible. You need to have your allergist complete an Allergy Packet prior to your first appointment with the Allergy Clinic. You will be required to remain at the Health Center 30 minutes after receiving your injections to make sure there are no adverse reactions. Physical Therapy services are available at the Health Center. A referral from a doctor is not required to use these services. You must be a UCF student, faculty or staff to use these services. Most insurance plans are accepted and discounted self-pay rates are available. AdventHealth Sports Med & Rehab is the provider of this service and is not associated with students’ Health Fee benefits. To make an appointment directly with the rehab center, please call 407.303.6610. New patient forms can be found here. UCF Student Health Services is well equipped to assist Type 1 diabetic students with their day-to-day health needs. We can refer to a local endocrinologist if needed. There is also a Type 1 Diabetic program which provides a variety of special support and educational services. The group meets monthly and free dinner is provided! Please visit the Type I program webpage to submit your contact information to be included in the email announcements. Our International Health Clinic supports the wellness of both students traveling abroad and international students alike. Our providers specialize in travel-related education and culturally sensitive health care services. Appointments are free. Available for students traveling or studying abroad, our Travel Clinic will provide you with the latest information from the Centers for Disease Control. The Travel Clinic Provider will provide you with counseling on: tips for a safe and healthy trip; recommended and required vaccinations; risks associated with diseases and epidemics; food, water and health precautions; and what to include in a travel kit. Be sure to schedule your appointment 6-8 weeks prior to your departure. Please fill out this worksheet and bring to your appointment. For patients who are more comfortable communicating in their primary language, interpretation services are available, through either bi-lingual staff members, or by use of a telephone medical translation service. EDMT is a team of professionals dedicated to the treatment and care of eating disorders and body image concerns. Medical Providers, Dietitians, Therapists and Psychiatrists from Student Health Services and Counseling & Psychological Services have joined together to help you. To get started, see one of the medical providers at the Health Center, or a Counselor at Counseling and Psychological Services. They will refer you to the EDMT team if you can benefit from that approach. There are two stations located within the Health Center: Dental Clinic waiting area and Immunizations. The Relaxation Station is an opportunity to use an online application to assist in developing increased relaxation. This is a walk-in FREE service and is available to all students during regular business hours. For more information on the Relaxation Stations, visit www.whps.sdes.ucf.edu. If students require specialty care outside of our in-house services, UCF Health, our College of Medicine faculty practice, can help students in areas such as endocrinology, dermatology, gastroenterology and more. These appointments are not covered under the Student Health Fee. Most major insurances are accepted. Learn more at www.ucfhealth.com.